Using the indirect-heat grilling method results in a tender juicy roast. This gourmet sandwich is delicious, but the peameal could also be served on its own as part of your breakfast, lunch or dinner. Heat greased barbecue for indirect grilling: Light one side of barbecue, leaving other side unlit. Close lid. Heat barbecue to 350ºF. Mix barbecue sauce, jam, vinegar, mustard and pepper in microwaveable bowl. Microwave on HIGH 2 min. or until smooth and glossy, stirring every 30 sec. Cool slightly. Toss mangos with 1/4 cup of the barbecue sauce mixture; set aside. Reserve 2/3 of the remaining barbecue sauce mixture for later use. Brush meat with remaining barbecue sauce mixture. Place meat over unlit area of barbecue; place mangos over lit area. Grill 7 to 10 min. or until mangos are evenly grill marked, turning after 5 min. Remove mangos from barbecue. Grill meat additional 35 to 40 min. or until done (160ºF), turning and brushing with reserved barbecue sauce mixture after 20 min. Remove meat from barbecue. Let stand 10 min. Meanwhile, chop mangos; place in medium bowl. Add onions and mint; mix lightly. Grill baguette, cut sides down, 1 to 2 min. or until toasted; turn. Cover bottom half of baguette with cheese; grill 2 min. or until melted. Cut meat into thin slices. 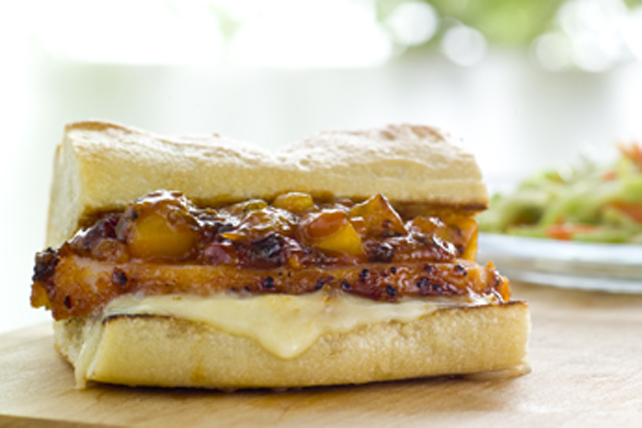 Fill baguette halves with meat and mango mixture. Cut into 6 smaller sandwiches. Substitute 3 fresh peaches or nectarines for the mango, fresh parsley for the mint, and/or Camembert for the Brie.